As we embarked on the process of researching all the material for our Graphic Design, Referenced book we secretly hoped that we could uncover something that neither Phil Meggs, Richard Hollis or Steve Heller had. Surely there was something or someone they could have missed. On the surface it seemed we wouldn’t have our Indiana Jones moment, and it was only after writing a few of the profiles that we were able to piece together the story of one designer who was briefly referenced by some of the most prolific designers of this time, among them Joseph Muller-Brockmann, Alexey Brodovitch and Lester Beall. It wasn’t until we went back to the RIT Design Archives, remembering that the Lester Beall collection had a significant amount of client correspondence, that we were able to confirm this unsung design hero: Ingrid Berthold. Design history has deeply celebrated the work of its most famous luminaries, the ones that helped shape graphic design as we know it today: From the early émigrés in the 1940s like Alexey Brodovitch, Erik Nitsche, and Ladislav Sutnar, to the American trailblazers like Alvin Lustig, Lester Beall and Bradbury Thompson, all the way to the corporate design mavens of the 1960s, Paul Rand, Saul Bass, Massimo Vignelli and Ivan Chermayeff and Tom Geismar. And it’s until recently that other designers like Robert Massin, Cipe Pineles or Sister Mary Corita Kent have been getting the attention they deserve. The difference between these designers and Ingrid Berthold, however, was that they were able to create a name for themselves by acquiring individual status and acclaim. Berthold remained constantly behind the scenes, as the right hand designer for many of the most celebrated designers. An unknown Batman’s Robin. Even other designers who have been placed in secondary roles are more well known: Tom Carnase generated hundreds of lettering beauties that are more commonly acknowledged to Herb Lubalin, Brett Wickens did most of the actual imagery that accompanied a large part of Peter Saville’s album covers for Factory Records, and Ed Benguiat has been designing logos for half of New York’s most prominent designers. Not Berthold. Her contributions to the design canon have gone mysteriously unnoticed despite them being integral. Berhtold was born in 1916 in Leipzig, Germany but grew up in Berlin where her father, Hans Berthold, worked as the bookkeeper for the famed H. Berthold type foundry, which had been founded by his uncle, Hermann Berthold. Her childhood was filled with the scent of molten metal and sounds of typecasting. Her time in Berlin was cut short, and in 1936 she and her family fled to Zurich, Switzerland escaping the rising Nazi regime. Through his knowledge of the graphic arts industry, her father was able to secure her a job with Joseph Muller-Brockmann, who had just started his own design studio. From Muller-Brockmann, Berthold learned the tenets of the International Typographic Style and while she wasn’t allowed to design, she observed his process and at night she would trace Muller-Brockmann’s work to understand the hierarchies of his design. 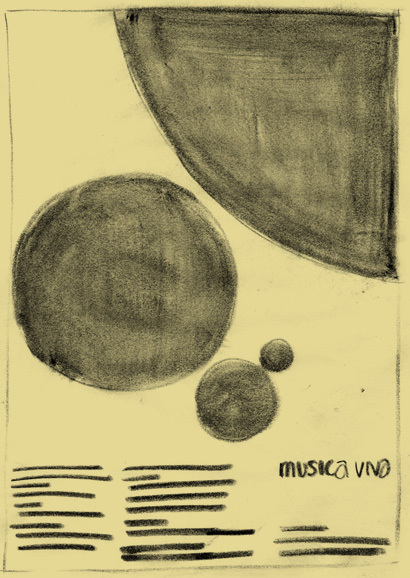 An original tracing by Berthold of Muller-Brockmann’s Musica Viva poster. Image courtesy of Museum für Gestaltung Zürich, Poster Collection. In 1944, Berthold and her family emigrated to the United States where they settled in New York like many of their expatriates. There she joined Harper’s Bazaar where she was a typesetter for Alexey Brodovitch, the commanding art director of the magazine. Three years later Berthold was hired by Cipe Pineles who had been recently hired by editor Helen Valentine to be the art director of Seventeen. In her biography, Cipe Pineles: A Life of Design, Pineles describes Berthold as “A very quiet person that demonstrated a keen sense of typography unlike any of the other typesetters.” While Pineles is one of the first women to break the design glass ceiling, Berthold remained in anonymity. Through William Burtin, Pineles’ second husband and Fortune magazine art director, Berthold met Lester Beall in the late 1950s, who was enjoying much success in the field of corporate identity and she soon joined him in his office at the Dumbarton Farm in Connecticut. At the RIT Design Archives we found the original proposal of Lester Beall vying for the International Paper identity project and in outlining his team’s profile, most of Berthold’s story is corroborated. Unfortunately, due to RIT’s strict reproduction policies, we can not reproduce the document without the consent of Beall’s estate. While working for Beall her own design explorations shaped most of the final solutions for clients like Caterpillar, Connecticut General Insurance and even International Paper, where she was the first to sketch an abstract representation of an I and a P forming a tree. After Beall passed away in 1969, Berthold, now 53 years old, moved to the West Coast where she settled in Portland, Oregon deciding to devote her time to teaching. She taught corporate identity at the fledgling design program at Portland State University. If that college sounds familiar it would be because Carolyn Davidson, who famously charged a mere $35 in 1971 for the Nike logo, was a student there at the time. Berthold was her teacher. Miss Davidson was kind enough to send us a scrap of paper she’s kept all these years, with Berthold’s original sketch idea for the now famous swoosh. Davidson assures us it was a collaborative effort and it was the result of a brainstorming session that led to the design. Berthold, not remotely interested in running shoes rendered any credit to Davidson. Original sketch of the Nike logo by Berthold. Courtesy of Carolyn Davidson. Berthold spent her last years in Portland and passed away at the age of 68 in 1984. There aren’t many undiscovered designers that have played a significant role in the development of graphic design. We are grateful that we were able to recognize Ingrid Berthold in our book. "We do not follow maps to buried treasure and X never, ever marks the spot." great find Armin, looking forward to the book. Assumed it was a joke and the Nike logo bit confirmed it. Nice, trying to pull of two in one day! Are there any surprises hidden on Word It? Much more successful than the verizon number. The dodgy tracing on musica viva gave it away though. Indeed, April Fools, and inspired by Forrest Gump and the opening titles of Watchmen. It reminded me of House Industries' René Albert Chalet prank. I cannot tell you how many times I've seen the Chalet stuff taken as legit. I think even the Unbeige blog once referenced him seriously. A quality prank indeed. House went to great lengths, what with getting real-life design celebrities to make glowing comments about a non-existent designer! Not unlike Susan Sontag's appearance in the movie "Zelig". Which brings us back to "Forrest Gump," I suppose.